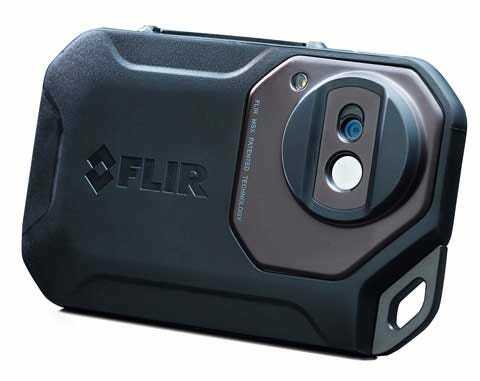 "A compact, affordable thermal camera"
The FLIR C3 Compact Thermal Camera stands out for its portability and usability as well as an ability to quickly export both videos and still images. The 80 x 60 pixel thermal sensor detects temperature from -10˚C to 150˚C and differences of just 0.1˚C are depicted on screen so it is suitable for applications such as HVAC tasks, facilities maintenance, building inspections, and electrical repair. 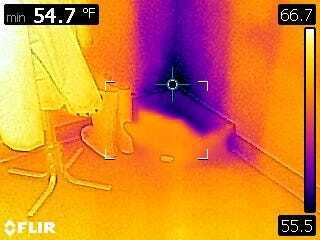 Emissivity can be set by the user to compensate for different materials and the camera is accurate to ±2˚C or 2%. Thermal images and video are shown in a range of palettes on the bright 3” colour touch screen and the user can select a measurement box to measure the hottest or coldest spots as required. A spotmeter is available and extra detail is added with MSX® technology using the FLIR C3’s in-built digital camera. The large 41˚ x 31˚ field of view allows quick inspection over a large area whilst focus-free imaging guarantees clarity. With intuitive operation through the touch screen, still and moving images from the FLIR C3 are easy to take, view and upload via USB or wi-fi to smart devices for further analysis. Radiometric data are saved alongside the images and further analysis is possible through FLIR Tools software which also facilitates video streaming. There is space for up to 500 image sets in the internal memory. The small dimensions (125mm x 80mm x 24mm) and low weight (130g) of the FLIR C3 mean it can sit happily in a pocket and it is tough enough to withstand daily use. The rechargeable battery powers the device for around two hours and it comes provided with a battery charger, lanyard, pouch, tripod mount, USB cable and printed documentation. FLIR’s 2-10 warranty guarantees the device for two years and the sensor for ten so the user can have confidence in his/her purchase. Video containing temperature data can be exported for further analysis. Area: Box with max. or min.